Did you know that Zurich is a haven for the arts? Possibly. Did you also know that there is an incredible variety of off-space, artist-run and/or independent art venues in this fair city? The Zurich Art Space Guide has been created for locals and visitors answering ‘Nope’ to the latter question. 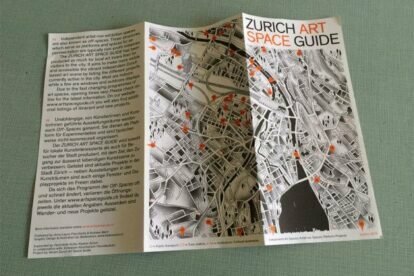 It is updated regularly and lists all the spots that are part of Zurich’s vibrant off-space art scene. Currently in its fourth edition, the guide is available online and also as a printed booklet with a handy map – pick it up at any of the listed venues. The programmes of the featured spots are not listed, since they change more frequently than the weather here. So do your research first; the guide provides web links on its site and they share some events on their Facebook page. Then go ahead and dive into Zurich’s art world while staying safely off the well-trodden path. Experimentation, surprises and discovering a lesser-known side of the city are awaiting you.